I bought two treats for myself yesterday at Fairway: shrimp (on sale! ), and kimchee. I love kimchee, and will eat it with damn near anything. The Good Fork, an excellent restaurant in Red Hook, Brooklyn, offers Steak and Eggs Korean Style, which is served atop a bed of fluffy, spicy kimchi rice. I was thinking of this dish today as my friend Liz and I were making plans to have dinner at Good Fork, and since I’m impatient and had both kimchee and cooked rice in my fridge, I wanted to make it for dinner tonight. Frozen cleaned, raw shrimp are super convenient and totally worth the money when you can find them on sale. You can get several meals from one bag. Shrimp also defrost quickly, so you can use them in a pinch. The important thing is that they are fully defrosted and dry before you cook with them. About the cooked rice – this may not be an item you keep in your fridge, which is fine. You can always use those quick-cooking packs from Trader Joe’s, or those Minute Rice bowls from the supermarket. I like to cook a lot of rice at the beginning of the week, so I have it for salads and side dishes the whole week long. It also keeps well in the fridge. 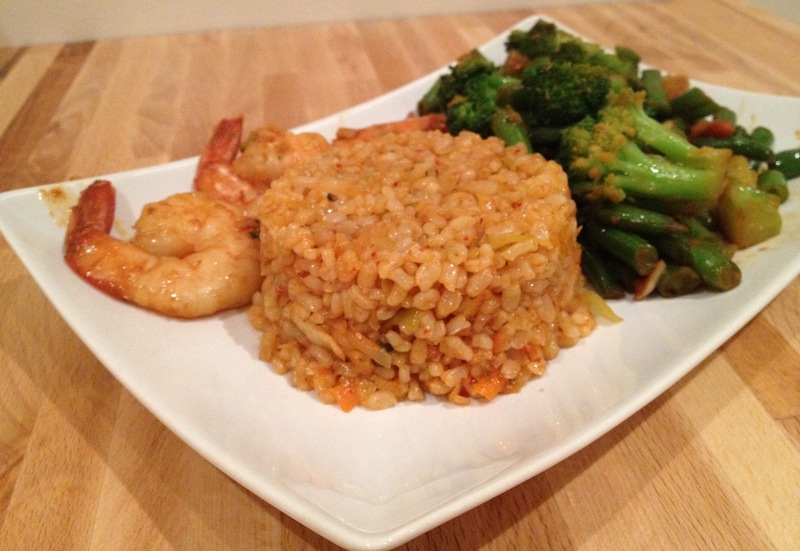 The easiest, most low maintenance way to cook brown rice can be found here. The recipe below can easily be adapted for two people – add another half cup of rice, and double everything except the oil. You shouldn’t need that much more. The fastest way to do this is with two skillets on the stove simultaneously, but if you only have one skillet (at leat 9″), cook the rice first, and then the shrimp and vegetables. Turn the heat on to medium strength under Skillet 1. Give it about two minutes, and add 2 teaspoons of vegetable oil. Swirl around the pan. Give it another 2 minutes, and add the rice. Stir to coat with the oil, and let cook on medium – low heat. Turn the heat on to medium strength under Skillet 2. As before, give it about 2 minutes and add 1 teaspoon of oil this time, then swirl around the pan. Then add the shrimp, and let cook without stirring, for 4 minutes. Add 1/2 a tablespoon of soy sauce, the garlic, and ginger, then turn the shrimp over and let cook another 4 minutes or so, until you can see they’re cooked through at the middle. Be careful not to burn the garlic and ginger. 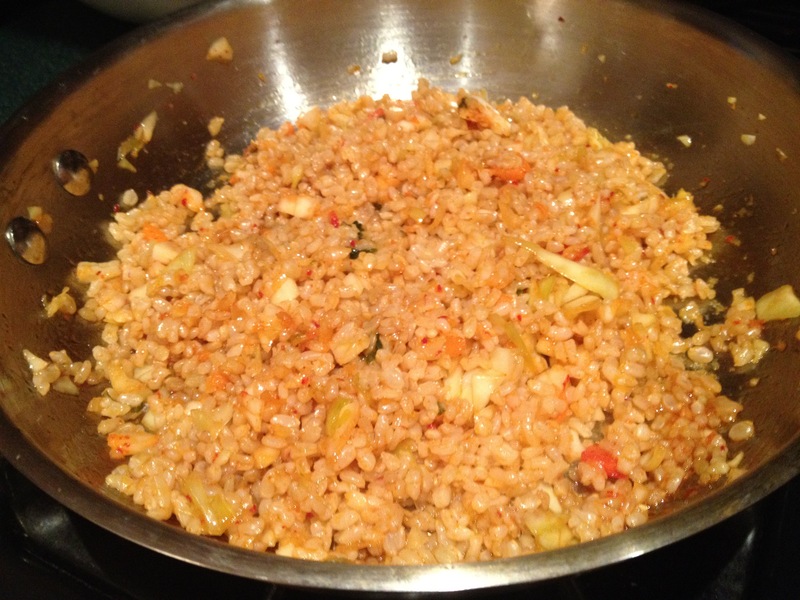 In Skillet 1, add the kimchee to the rice and stir, continuing to cook on low heat for another 4 – 5 minutes. Then turn off the heat and set aside. 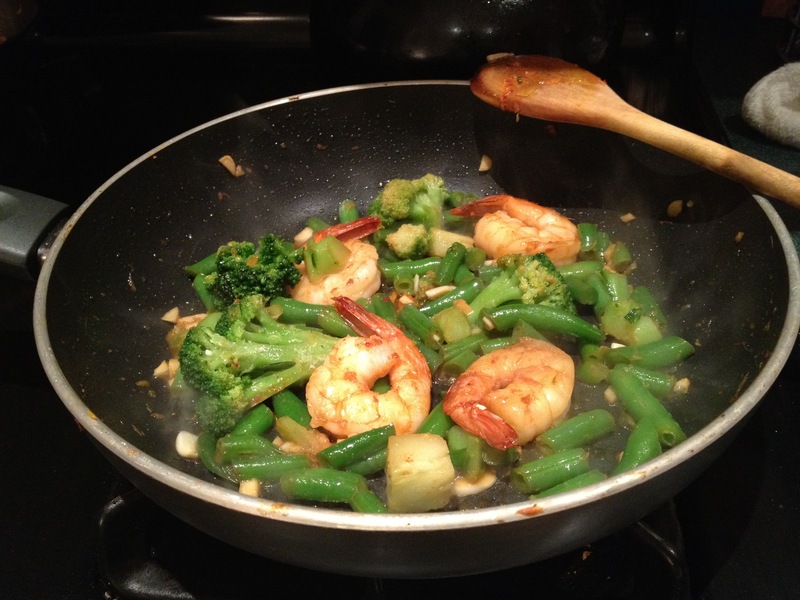 Once the shrimp have cooked, set them aside in a separate dish and add your vegetables to the hot pan. Stir-fry them for about 2 minutes, then add a tablespoon of water and cover the pan for another 2 minutes. This helps to accelerate the cooking of the veggies, and still keep them crisp. Remove the cover, and allow to cook for another two minutes before adding the shrimp back to the pan. Stir, add the remaining soy sauce, the sriacha and the sesame oil, and cook for another minute. Turn the heat off. Now for presentation. Instead of just scooping the rice onto my plate, I like to put it into a measuring cup or ramekin, press it down slightly, then take cover my ramekin with my plate, topside down, and then turn over and lift the ramekin. Ta- daa: a perfectly portioned and lovely presentation of rice. If you do this, too, you’ll have leftovers in the pan (totally not a bad thing). Spoon the shrimp and veggies next to your rice, and top with the chopped green onion (which I forgot to do before taking the photo below). And now you’re ready for dinner. 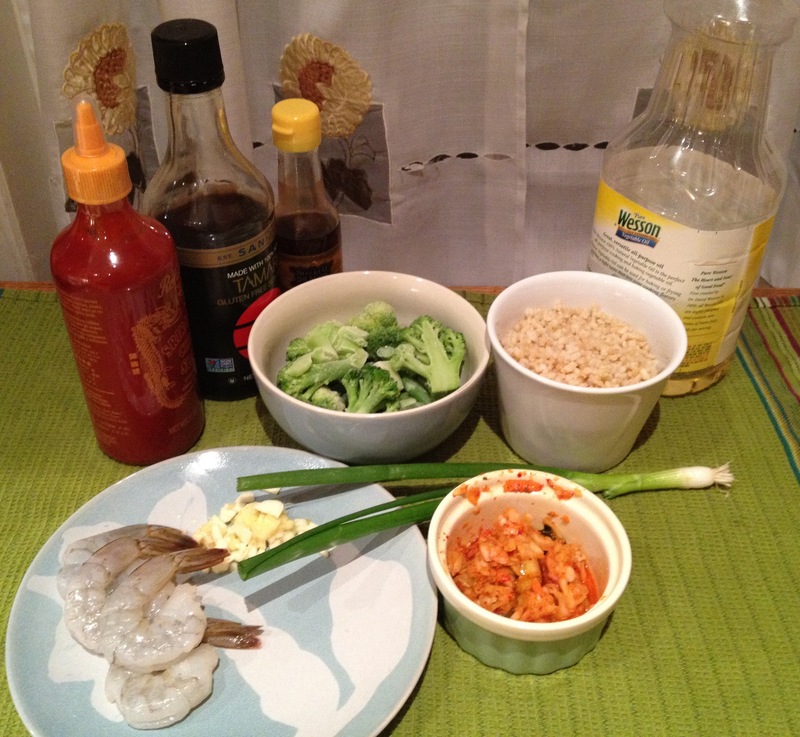 This entry was posted in Recipes and tagged dinner, easy, entrees, fast, kimchee, kimchi, mains, quick, recipes, shrimp, spicy, veggies. Bookmark the permalink.